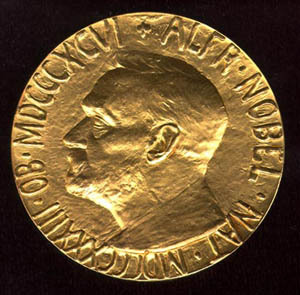 The Nobel peace prize can be traced to the Nobel family, specifically Alfred whose picture is found on the actual medal. Alfred personally invented dynamite and owned a major weapons dealing company named Bofors, which has since been acquired by the multibillion dollar weapons manufacturing giant BAE Systems, a key player in the military industrial complex. Alfred also found Dynamit Nobel AG in 1865 which is still in operation, a multibillion dollar German chemical and weapons company. of its time, and launched the world's first diesel-driven tugs and tankers and also built the first European pipeline. The younger brother, Immanuel Nobel, was an engineer developer of underwater naval mines. As you can clearly see the Nobel name and peace share very little in common. People have began questioning the credibility of the award ever since Barack Obama received it shortly after taking office for basically sweet talking the world, yet soon after found himself involved in several wars not to mention his actions since - such as the signing of the NDAA. The Nobel peace prize, however, has been awarded to individuals for controversial reasons in the past before. Henry Kissinger was given the award in '73 for his supposed work on the Vietnam Peace Accords, which was on outrage considering his involvement in the illegal bombings of Cambodia via Operation Menu. A former head of the the militant Zionist group Irgun, (considered by many as a terrorist group) Menachem Begin was given the award in '78, Al Gore who was awarded the Nobel in '07 for his documentary "An Inconvenient truth" which proved later to be filled with inaccuracies and hypocritically called for people to make efforts to conserve energy but In August 2006, Gore’s electricity bills revealed that in one month he burned through 22,619 kilowatts – more than twice what the average family uses in an entire year! [Pg. 17 "The Really Inconvenient Truths", Iain Murray] It is very sad that these men won were GIVEN this peace prize when Mahatma Gandhi, despite being elected 5 times, was never awarded a Nobel. For more controversial winners of the award check this list. Considering the history of the Nobel "peace" prize is it really such a surprise that the EU has now received it? The only surprise here is that not more people come to see it for what it is... nothing more than a tool used for political propaganda by those that control the monopoly game that we call life. One more reason to ask the infamous question... WHY?? the Nobel The Nobel Foundation plans to build an enormous Nobel Center in Stockholm. The whole site has to be excavated (with dynamite ?) down to 9 meters and large masses of clay and stone has to be transported through the fragile inner part of Stockholm. The Nobel prize was created because Alfred Nobel was rightfully called "the death merchant" and he did not like that. Also another Nobel prize winner that did not deserve was Mother Theresa and Gandhi two very evil people for people that actually know history. Bob Dylan was awarded the N-prize in literature but he won´t come to Stockholm to pick it up.